Saturday and Sunday, July 20 – 21, 2019 – 7:30 AM – 6:30 PM | $2,000 Early Bird Special (reg. $2,500) Expires June 20, 2019 – Register Today! Saturday and Sunday, September 28 – 29, 2019 – 7:30 AM – 6:30 PM | $2,000 Early Bird Special (reg. $2,500) Expires August 21, 2019 – Register Today! Saturday and Sunday, November 16 – 17, 2019 – 7:30 AM – 6:30 PM | $2,000 Early Bird Special (reg. $2,500) Expires October 16, 2019 – Register Today! 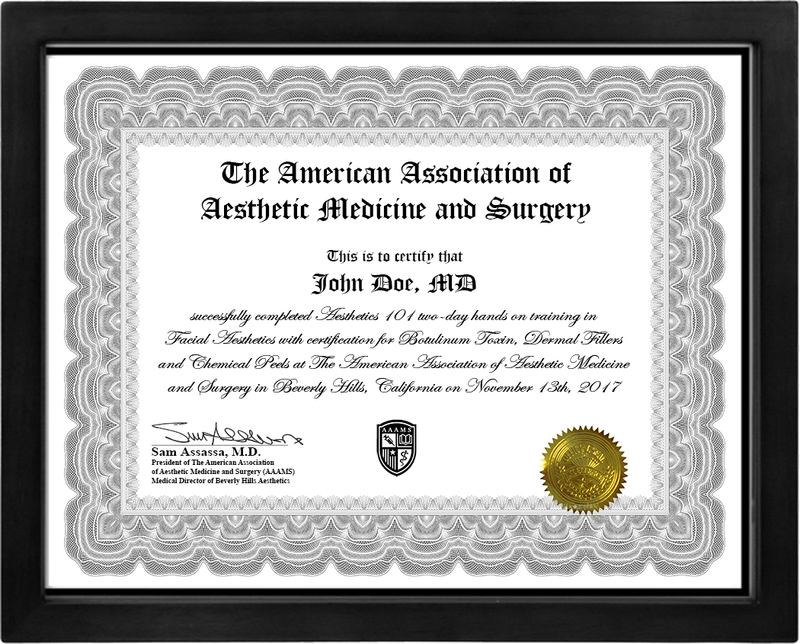 Upon registration, attendees will be granted access to the online learning management system and enrolled in The Facial Aesthetics Master Program by Dr. Sam Assassa, President of The American Association of Aesthetic Medicine and Surgery. 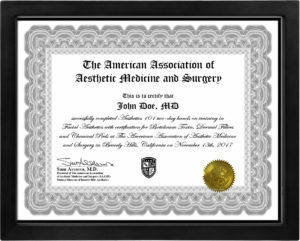 This online program is a comprehensive series of online training programs designed to provide members with a robust foundation for understanding facial aesthetics. Dr. Assassa provides his knowledge and professional expertise with over 15-hours of training video content to cover these essential facial aesthetic topics. These comprehensive online aesthetics courses serve as a prerequisite didactic session for the hands-on training course and are designed to provide a comprehensive understanding of contemporary facial aesthetics on both a fundamental and an advanced level. The online aesthetics courses include a required assignment at the conclusion that will measure the attendee’s level of understanding and test his or her knowledge. The online aesthetics courses not only help prepare attendees for the advanced hands-on session but it maximizes on the whole approach to facial aesthetics. This program starts with a brief introduction describing how the art of aesthetics directly ties into the field of facial aesthetics. This program introduces members to the concept of facial BeautiΦication, with an emphasis on the Greek symbol Φ, which represents Phi, described in this program as the Golden Ratio of Beauty. This program also introduces members to the ideal facial dimensions and how they relate to the overall appearance of the face. In addition, this program provides an in-depth look at the facial anatomy described as Facenatomy™. Lastly, members will understand the aging process and how to apply the 4R’s of Aesthetics to restore beauty and youth in the face. This comprehensive program covers the history of neurotoxins, molecular structure, mode of action, indications, and contraindications. In this program, members will learn about BotoxNatomy™, which details the different facial expression muscles anatomy and their associated actions. Members will also look at the clinical application of neurotoxins covering the proper clinical assessment, markings, dosage, the art of injecting neurotoxins to soften expressive lines and create upper and lower facelift, pitfalls and how to address them. Lastly, members will have a first-hand look at a collection of videos that demonstrate the art of injecting the forehead, droopy eyebrows, crow’s feet, frown lines, bunny lines, gummy smile, lips definition, chin enhancement, jawline and lower face contouring and platysma bands. This online program is designed to provide inexperienced practitioners with a comprehensive understanding of neurotoxins and further enrich the knowledge experienced injectable practitioners. This detailed program explores the facial aging process and facial analysis pertinent to dermal fillers, classification of dermal fillers, indications, and contraindications. Also covered is the anatomy and techniques of regional nerve blocks of the face, injection techniques of upper, middle and lower face and how to avoid and treat dermal fillers complications. Lastly, members will be able to watch a series of demonstration videos covering eyebrow lift, glabellar and forehead lines, nasolabial folds and marionette line corrections. Members will see proper injection techniques for treating hollowness under the eyes, tear trough deformity, enhancement of the cheeks, creating natural fuller lips, and contouring the chin and jawline. Lastly, members will have access to a series of improvised reality videos, where Dr. Sam Assassa straps a GoPro camera to his head while consulting and injecting patients. This unique experience provides a first-person perspective of day-to-day practice as an aesthetic practitioner. This lecture starts with a brief introduction describing how the art of aesthetics directly ties into the field of facial aesthetics. Additionally, this lecture introduces members to the concept of facial BeautiΦication, with an emphasis on the Greek symbol Φ, which represents Phi, described in this lecture as the Golden Ratio of Beauty. This lecture also introduces members to the ideal facial dimensions and how they relate to the overall appearance of the face. In addition, this lecture provides an in-depth look at the facial anatomy described as Facenatomy™. Lastly, members will understand the aging process and how to apply the 4R’s of Aesthetics to restore beauty and youth in the face. This in-person hands-on training session is designed to build confidence in injecting, practice proper delivery on mannequins, develop technique under supervision, and test your skills on real patients. Upon completion of this session, attendees obtain confidence, and the proper skills to administer injectables and dermal peels on the very next day. To qualify for hands-on with real patients, you must show valid proof of medical licensure prior to the course. Introduction to the Business of Aesthetics is a comprehensive lecture that is designed to introduce members to the profitable business of facial aesthetics. This lectures covers business-related topics that are helpful to know when beginning a career in the field of facial aesthetics.